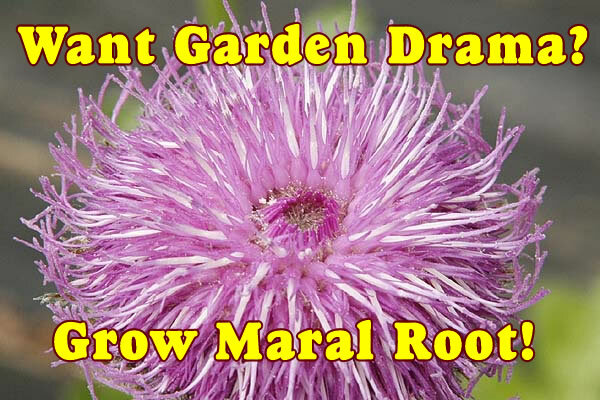 If you want drama and beautiful flowers in your garden at this time of the year then Maral root is for you. Exclusively for northern climates though, as Maral Root does not like really hot weather, but heck we need big dramatic plants in cooler climates. I just love this plant. 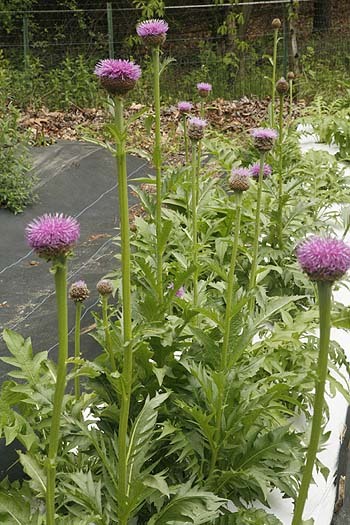 Beginning in late April the thick flower stalks start to rise from the large leafy base. 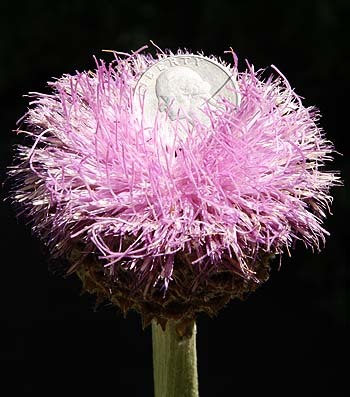 Its hard to stay away from them as the stalks get longer and thicker with a big rounded dome of a flower on the top. Finally the flowers open to show these large purple flowers that can last for several weeks. These flowers are so big and showy that they draw everyone to see them. Nothing much else is flowering at this time of the year. Most spring flowers have finished and the summer ones are still thinking about gearing up so Maral root fits nicely into that gap where there are few flowers except shrubs in the garden. If you have the space its well worth having and everyone will admire (and possibly covet) your plants. Once established they take very little care at all, some water and a little feeding to keep them in top shape and remove the dead leaves in the winter. That’s about it. The downside is that they do like cooler weather as they are a native of Siberia. Most likely won’t grow well below zone 7a but above that right up to zone 2 and most likely zone 1 if it’s well mulched over the winter. It’s a tough perennial that will flower from seed in the second year and then keep flowering and growing bigger as the years go along. It has large tough roots which can be very hard to dig out once established so choose your location well. Its fairly easy to grow if you start the seeds early and keep them cool. Zones 6 and 7a plant in a semi shaded location lower number zones full sun should be fine but don’t put them in suntraps where they may overheat. The only problem is that other mammals also like Maral root. Deer seem to really enjoy the leaves, we think the rabbits eat them but since the deer do its hard to tell. The only managed to flower after we put them behind a deer fence, but even with deer browsing the roots refused to give up and die. Voles are another problem. These plants produce big fleshy roots which are used in herbal medicine well the voles like them too and will eat the roots out from under the plants. Controlling voles may be very necessary if you want to have good Maral root plants. Or plant something else the voles like better (like Angelica) and let them eat that instead.